Dutch painter, the fifth child of Symon Jansz. Brouwer, a wholesale merchant, who moved from Alkmaar to Amsterdam in 1590. His older brother Jan was also a painter and there has been considerable confusion in the literature about their lives as well as their work, since their styles are very similar and both signed their works J. Pynas or in monogram.According to Houbraken, Jan Pynas accompanied Pieter Lastman to Italy in 1605. If this is true, he must have returned north by 1607, since he is documented as living in Amsterdam at the beginning of that year. Although Houbraken does not mention a trip to Italy by Jacob, it has generally been assumed that he also accompanied his brother and Lastman. However, given the artist's young age, this may not have been the case. If an early Italian trip for the Pynas brothers remains only hypothetical, there is substantial evidence that Jan was in Rome in 1617 when he signed and dated a drawing of Laban Searching for the Idols (Rijksprentenkabinet, Amsterdam). It may well be that Jacob's "biographl" tppabs="http:www.wga.hu/database/glossary/glossar3l#italianate*/, 'newWin', 'scrollbars=yes,status=no,dependent=yes,screenX=0,screenY=0,width=300,height=300');w.opener=this;w.focus();return false">Italianate style was based not on first-hand experience, but assimilated through Jan's work. 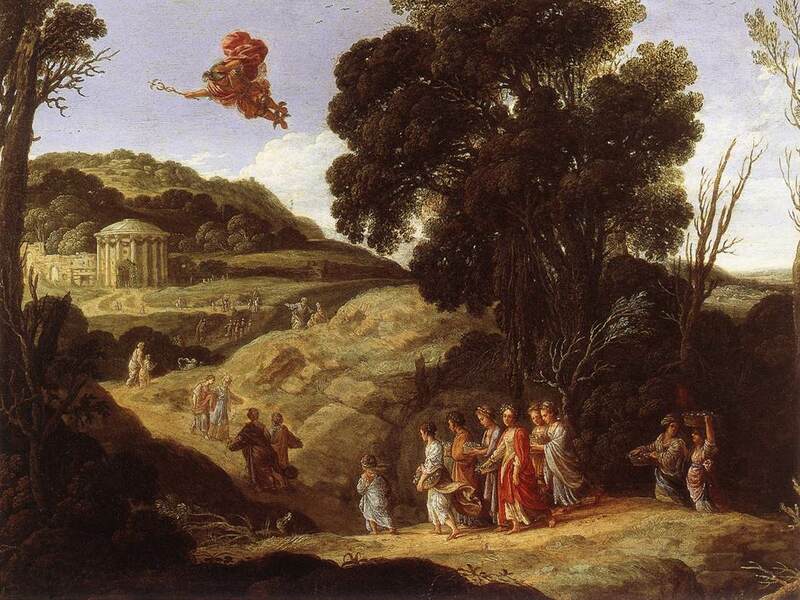 On the other hand, it is Jacob's work, not Jan's, that demonstrates the clearest affinity with the landscapes of Adam Elsheimer and Paul Bril, both of whom were working in Rome during the first decade of the seventeenth century.Jacob's work consists mainly of small landscapes with biblical or mythological scenes, that often contain images of classical remains. Such works are so close in style to Elsheimer that in the past they have frequently been attributed to the German artist.